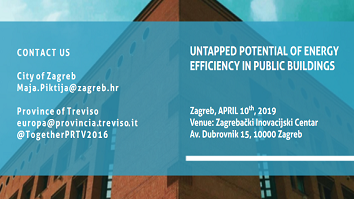 To conclude the Interreg Central Europe TOGETHER project started in 2016, Covenant signatory city of Zagreb, Croatia, will organise a final conference “Untapped potential of energy efficiency in public buildings”. Project partners and experts in the fields of energy, marketing and education will present activities carried out over the course of the three years’ period of the TOGETHER project and provide answers on how to achieve a lasting change in the behaviour of individuals in their everyday lives, as well as which models and tools are useful in order to make the awareness of the need for energy savings a generally accepted norm of behaviour. Organised by the City of Zagreb and Interreg.